one of the best snacks, either for breakfast or in an evening as a late supper. Serve with Ooft! Codfish varies a lot, try to get boneless because its so much easier although slightly less flavor. Some Tesco's have it on the International counter. It may be enough to soak in boiling water for 15 minutes or you may need to boil, depends on how much salt. Drain and shred. Skin and finely chop 3-4 tomatoes and mix with finely chopped onion, garlic and hot peppers, and add to salt fish. Add avocado cut into cubes, and salt and pepper (may not need salt if fish still salty) , then mix with squeezed lemon or lime and virgin olive oil. Let it sit for a while for the flavors to mix and then serve as is on fried bakes, toast, fresh rolls or even crackers. 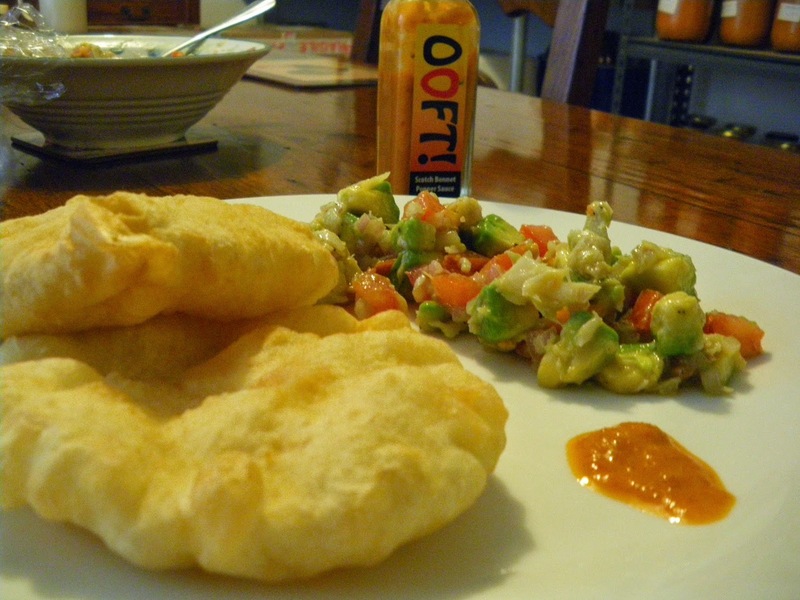 Fried bakes are made with flour, salt, baking powder and water much like a roti. Let the softish mixture sit for 1 hour and then tear off egg sized pieces and flatten and deep fry in about 1/2 inch or more hot oil. Spoon hot oil over the flattened bake to make it puff up. Fry until lightly brown and put in a tissue lined bowl to drain.